Caesar (English pl. Caesars; Latin pl. Caesares) is a title of imperial character. It derives from the cognomen of Julius Caesar, the Roman dictator. The change from being a familial name to a title adopted by the Roman Emperors can be dated to about AD 68/69, the so-called "Year of the Four Emperors". For political and personal reasons Octavian chose to emphasize his relationship with Caesar by styling himself simply "Imperator Caesar" (whereto the Roman Senate added the honorific Augustus, "Majestic" or "Venerable," in 27 BC), without any of the other elements of his full name. His successor as emperor, his stepson Tiberius, also bore the name as a matter of course; born Tiberius Claudius Nero, he was adopted by Caesar Augustus on June 26, 4 AD, as "Tiberius Julius Caesar." The precedent was set: the Emperor designated his successor by adopting him and giving him the name "Caesar." Galba's reign did not last long and he was soon deposed by Marcus Otho. Otho did not at first use the title "Caesar" and occasionally used the title "Nero" as emperor, but later adopted the title "Caesar" as well. Otho was then defeated by Aulus Vitellius who acceded with the name "Aulus Vitellius Germanicus Imperator Augustus." Vitellius did not adopt the cognomen "Caesar" as part of his name, and may have intended to replace it with "Germanicus" (he bestowed the name "Germanicus" upon his own son that year). By this point the status of "Caesar" had been regularised into that of a title given to the Emperor-designate (occasionally also with the honorific title Princeps Iuventutis, "Prince of Youth") and retained by him upon accession to the throne (e.g., Marcus Ulpius Traianus became Marcus Cocceius Nerva's designated heir as Caesar Nerva Traianus in October 97 and acceded on January 28, 98 as "Imperator Caesar Nerva Traianus Augustus"). After some variation among the earliest emperors, the style of the Emperor-designate on coins was usually Nobilissimus Caesar "Most Noble Caesar" (abbreviated to NOB CAES, N CAES etc. ), though Caesar (CAES) on its own was also used. 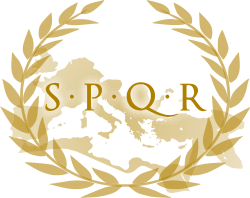 The use of Caesar for the junior partner in a consortium imperii naturally occurred also in break-away 'empires', eager to copy the Rome-proper original; e.g. the last Gallic emperor, Tetricus I, granted the title to his son, Tetricus II. On March 1, 293, Gaius Aurelius Valerius Diocletianus established the Tetrarchy, a system of rule by two senior Emperors and two junior sub-Emperors. The two coequal senior emperors were styled identically to previous Emperors, as Imperator Caesar NN. Pius Felix Invictus Augustus ("Elagabalus" had introduced the use of Pius Felix, "the Pious and Blessed", while Gaius Iulius Verus Maximinus "Thrax" introduced the use of Invictus, "the Unconquered"), and were called the Augusti, while the two junior sub-Emperors were styled identically to previous Emperors-designate, as Nobilissimus Caesar. Likewise, the junior sub-Emperors retained the title "Caesar" upon accession to the senior position. In the Eastern Roman Empire (modernly called "Byzantine Empire" by later historians), Caesar (Greek: Καῖσαρ) continued in existence as a title marking out the heir-apparent, although since the time of Theodosius I, most emperors chose to solidify the succession of their intended heirs by raising them to co-emperors. 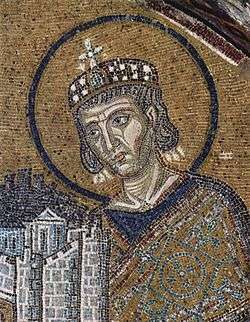 Hence the title was more frequently awarded to second- and third-born sons, or to close and influential relatives of the Emperor: thus for example Alexios Mosele was the son-in-law of Theophilos (ruled 829–842), Bardas was the uncle and chief minister of Michael III (r. 842–867), while Nikephoros II (r. 963–969) awarded the title to his father, Bardas Phokas. An exceptional case was the conferment of the dignity and its insignia to the Bulgarian khan Tervel by Justinian II (r. 685–695, 705–711) who had helped him regain his throne in 705. The title was awarded to the brother of Empress Maria of Alania, George II of Georgia in 1081. According to the Klētorologion of 899, the Byzantine Caesar's insignia were a crown without a cross, and the ceremony of a Caesar's creation (in this case dating to Constantine V), is included in De Ceremoniis I.43. The title remained the highest in the imperial hierarchy until the introduction of the sebastokratōr (a composite derived from sebastos and autokratōr, the Greek equivalents of Augustus and imperator) by Alexios I Komnenos (r. 1081–1118) and later of despotēs by Manuel I Komnenos (r. 1143–1180). The title remained in existence through the last centuries of the Empire. In the Palaiologan period, it was held by prominent nobles like Alexios Strategopoulos, but from the 14th century, it was mostly awarded to foreign rulers of the Balkans such as the princes of Vlachia, Serbia and Thessaly. In the mid-14th century Book of Offices of pseudo-Kodinos, the rank comes between the sebastokratōr and the megas domestikos. In the Middle East, the Persians and, later, the Arabs continued to refer to the Roman and Byzantine emperors as "Caesar" (in Persian قیصر روم Qaisar-e-Rūm). Thus, following the conquest of Constantinople in 1453, the victorious Ottoman sultan Mehmed II became the first of the rulers of the Ottoman Empire to assume the title "Caesar of the Roman Empire" (Ottoman Turkish Kayser-i-Rûm). 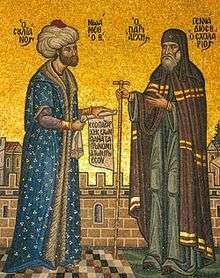 After the Fall of Constantinople, Mehmed claimed the title "Caesar of the Roman Empire" (Qayser-i Rûm) on the premises that Constantinople had been the seat and capital of the Roman Empire since 330 AD, and whoever possessed the imperial capital, naturally, ruled the empire. The contemporary scholar George of Trebizond supported his claim. The Eastern Orthodox Church recognized Mehmed's claim to the title, but Catholic Church did not, nor did the powers of Christendom generally. Gennadius Scholarius, a staunch antagonist of the West because of the Sack of Constantinople committed by the Western Catholics and theological controversies between the two Churches, had been enthroned the Ecumenical Patriarch of Constantinople-New Rome with all the ceremonial elements and ethnarch (or milletbashi) status by the Sultan himself in 1454. In turn, Gennadius II recognized Mehmed as successor to the throne. Mehmed also had a blood lineage to the Byzantine Imperial family; his predecessor, Sultan Orhan I had married a Byzantine princess, and Mehmed may have claimed descent from John Tzelepes Komnenos. Ottoman sultans were not the only rulers to claim such a title, as there was the Holy Roman Empire in Western Europe, whose emperor, Frederick III, traced his titular lineage from Charlemagne who obtained the title of Roman Emperor when he was crowned by Pope Leo III in 800 - although he was never recognized as such by the Byzantine Empire. In an Ottoman context, the title "Caesar" should not be understood as the minor title it had become in classical Rome, but as the glorious title of the emperors of the past, a connotation that had been preserved in Persian and Arabic. The adoption of the title also implied that the Ottoman state considered itself the continuation, by absorption, of the Roman Empire, a view not shared in the West. Romanian, Cezar, used as a first name. Today in age the writing of the name or title "Caesar" is not used, except only to refer to the most common form, Cesar, however this is only based on Hispanic cultures. The writing of Caesar is not taken into account. There have been other cases of a noun proper being turned into a title, such as Charlemagne's Latin name, including the epithet, Carolus (magnus) becoming Slavonic titles rendered as King: Kralj (Serbo-Croat), Král (Czech) and Król (Polish), etc. However certain languages, especially Romance languages, also commonly use a 'modernized' word (e.g. César in French) for the name, both referring to the Roman cognomen and modern use as a first name, and even to render the title Caesar, sometimes again extended to the derived imperial titles above. ↑ Bury, John B. (1911). The Imperial Administrative System of the Ninth Century – With a Revised Text of the Kletorologion of Philotheos. Oxford University Publishing. p. 36. 1 2 3 Kazhdan, Alexander (1991). "Caesar". In Kazhdan, Alexander. The Oxford Dictionary of Byzantium. Oxford University Press. p. 363. ISBN 978-0-19-504652-6. ↑ Kazhdan, Alexander, ed. (1991). Oxford Dictionary of Byzantium. Oxford University Press. pp. 363, 2026. ISBN 978-0-19-504652-6. ↑ Bury, John B. (1911). The Imperial Administrative System of the Ninth Century – With a Revised Text of the Kletorologion of Philotheos. Oxford University Publishing. pp. 20, 36.